Bring the chicken or vegetable stock to a boil; stir in the cous cous, cover, and remove from the heat. While the cous cous is steeping (this takes only about seven minutes), heat 2 tablespoons of the olive oil in a large skillet over medium-high heat. Add the garlic and red bell pepper and saute for 2-3 minutes; add the zucchini, season with salt and pepper, and cook for an additional 5 minutes or until the zucchini is just softened and the bell peppers are tender. Stir in the corn and cook 1-2 minutes more. 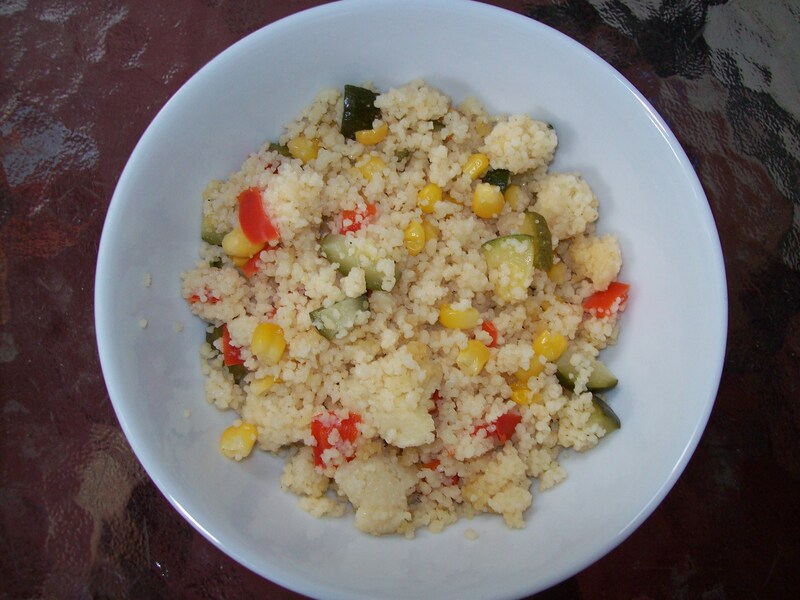 Fluff the cous cous with a fork. Add the vegetable mixture to the cous cous, drizzle with the lemon juice and one tablespoon of the remaining olive oil, and toss to coat. Taste the cous cous and adjust the seasonings; add the last tablespoon of olive oil only if you feel it needs more moisture. Serve at room temperature.